The British Library has fourteen floors, and 625 km of shelves that are home to a collection of incredibly valuable and often unique items. 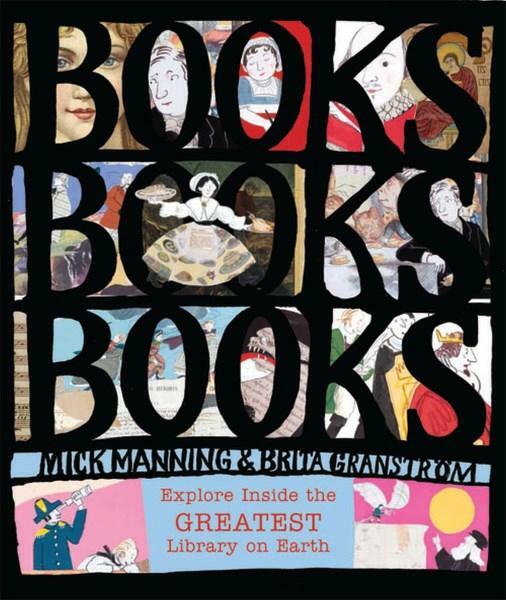 Books, Books, Books, by Mick Manning and Brita Granstrom, is a time travel tour of some contents of the British Library, which it calls the world's greatest (and biggest) library. The claim stems from the amazing history stored in it. Here we find more than twenty treasured artefacts put under the spotlight. Each is accompanied by key factual information and collage-type illustrations that are descriptive of the history. One of the 'earliest super-heroes', Beowulf, which is 'the oldest surviving long poem in Old English.' A great way to introduce children to early forms of the English language and literature. The Klencke Atlas, made for King Charles II, and 1.78 m by 2.1 metres in size (enormous!). The bestselling Victorian cookbook and guide to the household, Beeton's Book of Household Management (just one of many recipes and cooking books from the library that date as far back as medieval times). Books, Books, Books also references medical books, newspapers (such as the 1788 first issue of The Times), the notebooks of Leonardo Da Vinci and Charles Darwin, music (like Handel's handwritten scores), and the works of well known writers like Shakespeare, Jane Austen, the Brontes, Charles Dickens, the Brothers Grimm, and others. All the writers and works mentioned in Books, Books, Books are summarised at the end. 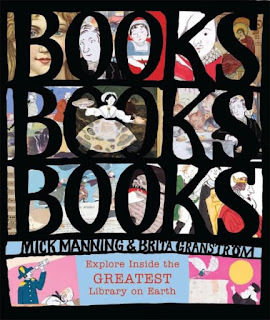 Books, Books, Books is an accessible 'history of the book' that lends itself to further exploration of literature and the world of books, perhaps with some side trips into other subjects of interest as well. It also encourages exploring and supporting other libraries, too, with specific mention of the USA's Library of Congress (founded in 1800), the National Library of Australia (founded in 1960), and local libraries.